My previous post on Host parasite interaction, a totally basic post has met with a lot of views and a couple of people have wrote back that the post was really worth it. Continuing with the theme, let me talk about another question, that is commonly a confusion in students. Often a term is used "Non cultivable bacteria". What exactly does this terminology mean? Till very recently, before the genomic era the only way you could study a bacteria was to grow them in large quantities in pure culture. That means microbiology was highly limited since there were so many organisms that simply wouldn't grow in the lab. For example, lets say you have put normal urine sample into a blood agar. Maybe in a seven days time 4 or 5 different organisms (Best case scenario) has grown. But we know that there are at least a thousand different species in the normal urine sample. And the rest are labelled "Non cultivable" or more commonly known as VBNC (Viable but non-culturable) organisms. Photo 1: Bacterial mixed culture. A question of challenge is why does the bacteria not grow. After all, the bacteria divided and reproduces normally. I have answered this question long back in a previous post (Link). Here is the important punchline. Its the conditions that we artificially create that determines what organisms grows. The nutrient content, the incubation temperature, length of incubation and if its a sample with mixture of organisms the type of organisms that are also present in the mix contributes to what will grow luxuriously. For example, If you will specifically remove organisms that are fast growing in a mix and incubate for a longer time, then chances are at least some of the other organism will grow. It is important to note that different bacteria have different requirements. Blood agar is great for multiple human pathogens but even then Haemophilus influenzae doesn't grow in it. 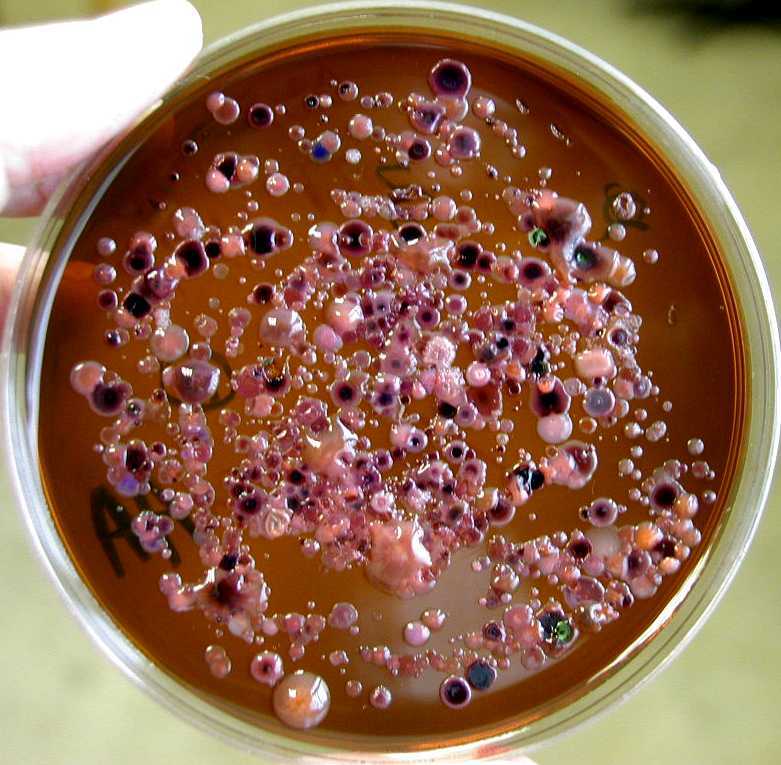 It needs a modified version of blood agar called chocolate agar. This is because H influenzae is not able to access the nutrients locked inside the RBC, we have to manually release it. Many different organisms previously not cultivated in lab, has been now grown with ease by simple modification of the culture medium. Some bacteria that have not been cultured previously have their genome sequenced and bioinformatic studies predicted the lack of certain pathways. By incorporating the nutrients the organism is unable to synthesize (computationally predicted), such organism have been grown. There are numerous examples about this. One more example which I learn't about recently is a great eye opener (Link). The summary of the post is that agar which forms the basic (Supposed to be non interfering) ingredient of the culture media can in itself be inhibitory to some bacteria. It must be noted that we are talking about pure growth. Some bacteria are simply incapable of forming pure growth. In such cases, there often is a complex network of signalling that underlies the growth of organism. Soil microbes are some of the best examples. Even in such cases, the bacteria has been fished out and grown using techniques such as isolation chip. I have convincingly demonstrated to you that there is nothing called as Non culturable. Its a misnomer in textbooks. The term basically implies that the bacteria has not been grown yet in the lab conditions, rather than it cannot be grown. There is a difference. HIV is an infection of great interest to international community. Despite years of research, neither has there been a successful vaccine nor a complete treatment. 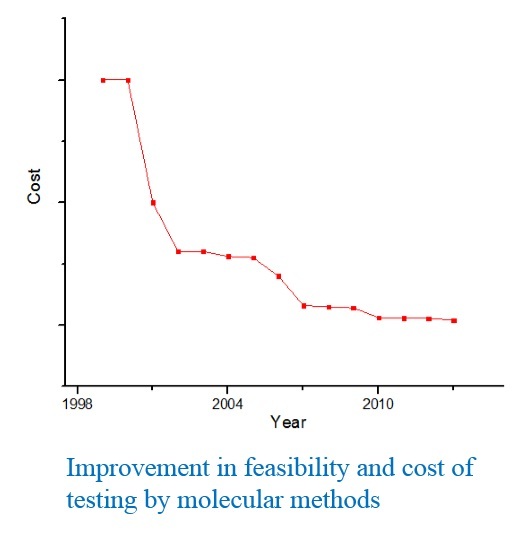 Needless to say we have been able to better the treatment options than it was a decade before. Most of the infected individuals have been able to live an extended normal life thanks to some of the best anti- retroviral drugs. The current research is aimed more at finding a complete cure rather than just finding new drugs. Pinnacle would be a successful vaccine. Recently an article was published in Nature news (Link) arguing that current HIV pandemic could be handled in a better way using current existing tools. As I have explained several times in my earlier posts, the grave problem in flushing the HIV out completely is the lack of ability to flush the latent virus. Studies have tried to tackle the issue by a variety of approaches such as DNA editing techniques, HDAC inhibitors etc. Though these approaches have promised potentials, its usefulness in treatment has been questioned. The key player in regulation of latency is the TAT molecule. I have argued in an older post (Link) that TAT is a good candidate to attack. I mentioned didehydro- Cortistatin A as a potential molecule. Let me refresh the idea. HIV integrated to host genome has to be regulated for its expression. Though NF-kB signalling in host has a large effect on HIV expression, the virus has a self control mechanism through TAT (Trans- Activator of transcription). Tat, with its cellular cofactor, the transcription elongation factor-b (P-TEFb) is recruited to the elongating RNA polymerase II (RNAP II) through interactions with the transactivation responsive element (TAR) and CDK9 kinase. The proviral replication has two phases- a tat independent phase and a dependent phase. In the absence of Tat, a series of short transcripts are produced due to inefficient elongation by the recruited RNA pol II. This is probably related to NF-κB based regulation. This basal level transcription leads to production of a short transcript of Tat. TAR functions as an RNA regulatory signal. The Tat recognition of TAR requires conformational changes in RNA structure. The conformational change involved realigns phosphate groups on the TAR RNA and ensure high affinity binding of Tat. 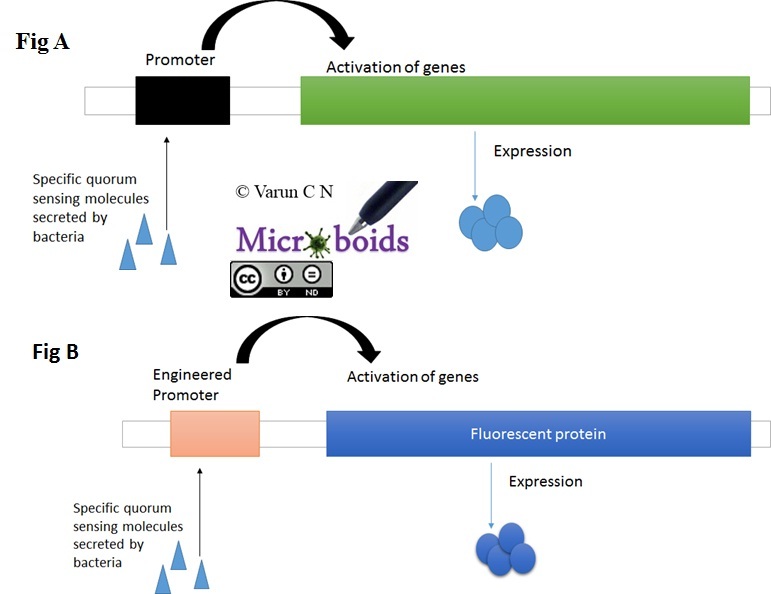 This system sets up a positive regulatory loop responsible for production of viral components. Fig 2: dCA mediated TAT inhibition. So you see, TAT is a very attractive candidate for attack. It is virus specific, no similar protein in host tissue, early viral expressed protein and key regulator of HIV latency. 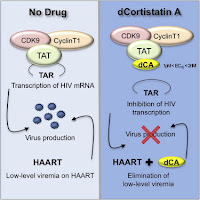 Earlier studies have characterized didehydro- Cortistatin A (A derivative of naturally occurring steroidal alkaloid Cortistatin A also referred as dCA) can inhibit the TAT feedback system thus effectively inhibiting the viral expression. The studies showed that dCA suppresses viral particle release from CD4+T cells. In other words they impair the ability to reactivate from latency. 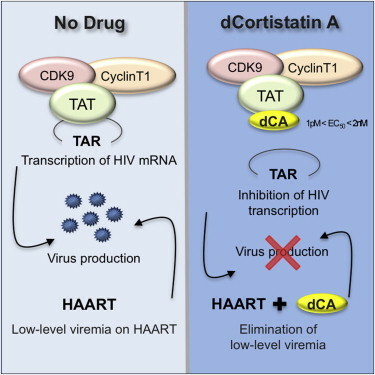 A more recent study published by Mousseau et al; has looked into more details of this mechanism and showed that use of dCA along with ART (Anti Retroviral Therapy) may provide a excellent way of reducing viral rebounce. There are of course a couple of issues. For example, this is not an absolute therapy. There is a level of basal transcription of virus that can happen in the absence of TAT. This can be seen from the data in the study showing that when tested against patient cells, dCA reduced an average of 92.3% of the viral reactivation in lab stimulating conditions. Now here's the punchline. When dCA was withdrawn, the block still appears to work indicative of a permanent change or at least a long-term change. The authors suggested that the promoter is probably altered. Based on these findings they hypothesized two possibilities (Quote from paper) (i) dCA simply accelerates the establishment of typical proviral latency by facilitating the corresponding epigenetic modifications; (ii) because dCA blocks a subset of the multiple Tat activities, it may result in unique epigenetic changes. 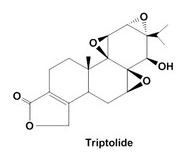 Fig 3: Structure of Tritolide. A yet another mechanism that is less discussed is targeting TAT degradation. If a compound can specifically increase the proteosomal degradation rate for TAT, it could be equally effective in preventing reactivation. One such compound is Triptolide. Currently this is another possible drug under investigation. Research has also been done one antibodies that may target TAT domain directly, However not much convincing data is available in this case. I have also heard of designs of TAR decoys and possible chemicals that may attack the TAT-TAR interaction. However, I have not seen a convincing data on these too. Perhaps readers can suggest me of any paper they known of. To conclude and make a statement, TAT is one of the leading molecules preferred to be attacked. With molecules being identified that has potential activity. Pharma companies are bound to pick these and make modifications to yield better chemicals, that may ultimately help us in significant betterment of HIV therapy. Recently, I had taken a break and announced that I plan to introduce certain new series additions to the blog. Other than routine posts talking about new research in microbiology under various categories, I had a couple of guest posts, Blogger's desk and more recently Lab series talking about a variety of lab related stuff. All these posts were written expecting that people reading these stuff have a certain level of basics. Surprisingly, it came to my attention that people want to see posts that are absolutely basic. I had been under the impression that the basic ideas are evident in my posts. So I'm adding a new series that will be called "Back to Basics" or BTB in short. Everyone who is learning about Medical microbiology is aware of an array of factors called as "virulence factors", that determine the ability of the organism to successfully establish itself. Long ago, I have posted on how the textbook idea of virulence factor is not right (Link). The important basic biological question in this post is "Is the organism evolved systems so that it could be damaging to host". To answer the question let us divide the question into two segments. First, Is damaging the host an objective of the pathogen? So why does the pathogen cause harm if that is not its primary objective? Coming to the first question. We are classically taught to think that pathogens are inherently damaging. Note that the term "Pathogen" and "Pathogenesis" is so loosely applied in literature. Well in reality, that is not its primary objective. The primary goal of the organism is simply to replicate and reproduce using resources from the host. However, the host responds in such a way as to not give up its hard earned resources for free. The counter measures and counter-counter measures that evolves from this complex interface is responsible for evolving molecules and interactions of what we call as "pathogenesis". There is a compromise that a pathogen has to make. If its too good at attacking, it will destroy the host in a time span far too less equipped for it to replicate and transmit. If it is too slug then host will get it off the system before it had a chance to do anything. And the line of balance that is in between is too thin. So, let me make the answer clear. It is not the aim of pathogen to inflict damage. There is altogether a different reason for lethality of certain pathogens. Second question. As I already mentioned above its the interface of interactions that actually matters. Let us take the example of hemolysins since this is perhaps the most easily understood. What is the advantage to the bacteria that produce a hemolysin say in an example case of E coli? In reality secretion of hemolysin is a complicated process with a lot of dedicated machinery. In this scenario the system is actually an evolved mechanism to obtain Iron. Hemolysin breaks up the RBC so as to release the Iron molecules in it. There isn't any other vested interest for bacteria in the RBC. Subsequently bacterial molecules like enterochelin take up the Iron. Iron being a very rare precious molecule, host has also several molecules evolved to save itself from loosing that Iron. As a matter of fact there is a evolutionary pressure on both sides to develop systems that are better than the other in sequestering nutrient. This kind of defense is also known as Nutritional Immunity. But the net effect is the outcome of such an interaction, in this case hemolysis. I think that answers the second question. Another well studied example would be Urease enzyme, which is simply a mechanism to change the pH of surroundings to benefit bacterial living conditions. I think that settles some of the confusions, that isn't traditionally explained. The ideal definition of pathogenesis would then be, "ability to defend the ability to survive the host counter mechanisms so as to enable it to reproduce" (I just made it up for clarity of thought). 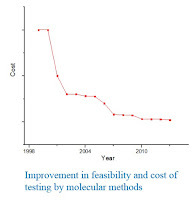 In a recent blog post I had talked about the need to detect antibiotic sensitivity pattern for a better health care (Link). I was arguing about it with a friend of mine, I was pointed to examples where knowing the organism is important more than the antibiotic. The best case scenario is water quality testing. In such cases once again the classic microbiological techs are laborious and time consuming. Need another example? How about food testing for microbial contamination. Think about it. Had you ask this question a decade ago, PCR would be the option of choice. It still does in most cases, but is expensive and needs the equipment's in place. Say you need to do the test in a remote area and you want results in less than a day. I can think of a lot of technologies that can give you answer in as short time as possible, at as less cost as possible. If you can catch it as fast as possible with as much as possible you are ahead of the pathogen in this game. In a nutshell we need 3 things- sensitivity, specificity and speed. Most of the technologies such as Immunoassays, PCR, Nanotechnology, chip array achieves the first 2 parts, but not the speed. Welcome to the concept- "Bactero-detectors". The idea is simple. You engineer a bacteria to find some other bacteria. When it does its gonna give you a signal. That sounds crazy. But its so much doable. I have already talked about engineered bacteria that maybe deployed to combat pathogens (Link). A fascinating idea of which I have heard is to use the quorum sensing system. If you build into a bacteria a genetic operon which responds to a quorum molecule specifically secreted by target bacteria linked to a response protein (which is a fluorescent protein) you basically have a Bactero-detector. See Fig 2 for Illustration. So lets imagine you have a water sample to be tested for Vibrio cholerae. Take about a 0.5ml culture of engineered bacteria, mix it with the water sample and wait. If vibrio is present it will secrete its specific quorum sensing molecules, picked up by the engineered bacterial promoter (supposed to respond only to that molecule). This will turn the fluorescent protein on and your mix which start giving a color. That's it. Since your detection system is a simple bacterial suspension you can have tons of this material easily maintained and such an assay will be cheap. detection of pathogen of interest. An extension of this idea is to use phage detectors. Instead of engineering a bacterial gene you put a luciferase system into a bacteriophage specific for the bacteria you want to detect. If the particular bacteria happens to be present in your sample phage will attack and the luciferase system will be activated. With the help of host ATP (Bacterial ATP), luminescence will be generated which can be easily detected. There are multiple smart modifications of this technique allowing for a range of detection. It looks like there is more to the story now. In a recent paper, by a smart genetic engineering technique (Link), conditions such as diabetes and cancer could be diagnosed in the lab with remarkable sensitivity. These are the new generation technology sometimes referred as microbial biosensors. Their ability to be miniaturized and cheap has is too good to not see it. Ever since I started posting I have been taking regular breaks from blogging and sometimes the break have stretched far too far. This year, I intended to post regularly and have been consistently writing posts. Its time for me to take a short break. Meanwhile I have some plans for introducing new sections in blog posts. Am also working on a possible new book (Oh, you heard it first here) for a general audience. I will be back soon. Meanwhile you can work up through my previous post that you have missed.